I love going to different bead shops. 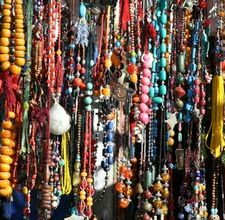 The rows of beads, colors, textures(glass, wood, ceramic, fibers, plastic), it doesn't matter. I love them all. Even the smell of new beads. OK, I know beads do not have a smell, but a girl can fantasize can't she. Buying new beads always gets the juices flowing, especially if I have a creative block. I am always looking for new and interesting ways to create new jewelry, with different beads and components. I received an email from EHOW. The article caught my attention right away. It was titled - How to Make Bahamian Sand Beads. After I read through the article, I thought I would share this information. When people want to make jewelry, but there are no beads in sight, they figure out how to make their own beads with the materials available to them. In the Bahamas, if you want to make some beautiful pieces of jewelry, all you have to do is go to the beach and scoop up some sand! If you don't have a beach nearby, you can still make these beads at home with a few inexpensive materials found at any craft store. 1. Collect 2 cups of sand from the beach, or buy some sand from a craft store. Make sure the sand is fine. Sift it through a screen or cheesecloth and rinse it off very well to clean it. Set it out in the sun and let it dry completely. 2. Pour the sand you prepared and two cups of papier-mâché into a clean glass bowl. Rub a coating of vegetable oil on your hands and add some glue. Knead the mixture into the consistency of bread dough. Add the desired amount of acrylic paint to make colored beads. Rinse your hands off and apply more vegetable oil if your hands get too sticky as you work. 3. Roll the sandy dough into the desired sizes and shapes for your beads. Let them air dry over night. 4. Pierce each bead through the middle with a large sewing needle after they've dried over night, or have just dried enough so that you don't crush them between your fingers. Since the beads are so thick, letting them sit for up to eight hours will not dry them completely. Don't let them dry all the way or you won't be able to poke a hole through them. 5. Brush a coat of clear acrylic glaze on each bead to make them glossy (if you want) and let them dry. Now you can make jewelry with your homemade sand beads.